From the most basic maintenance services, to major repairs, The Shop does it all. We pride ourselves on providing top-quality workmanship along with the excellent customer service you deserve. 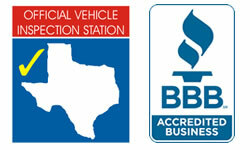 Whatever you may need, we are fully qualified to repair or maintain your vehicle. Our ASE Certified technicians work with state-of-the-art equipment to help ensure your vehicle is operating at peak performance. Whatever the situation, we've got you covered. At The Shop, our motto is "Any Make. Any Model. Any Service. Anytime." Please give us a try, you'll be happy that you did.